Max Eisen shares the powerful story of surviving the Holocaust, losing his entire family and building a new life in Canada. 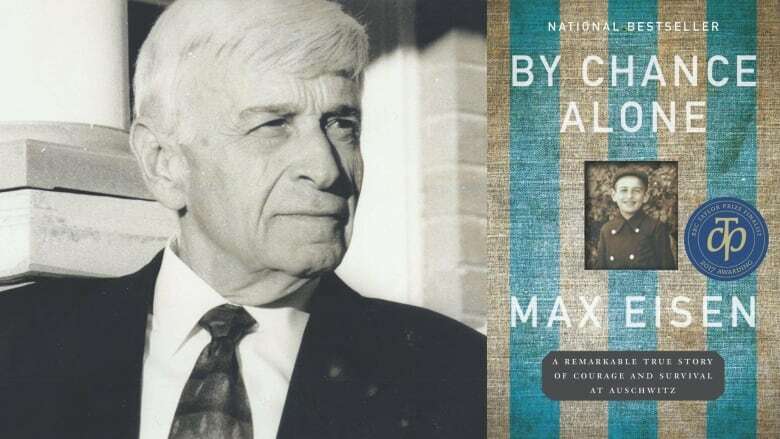 By Chance Alone by Max Eisen won Canada Reads 2019. It was successfully defended by science journalist and TV host Ziya Tong. The debates took place March 25-28, 2019 and were hosted by Ali Hassan. They are available to watch online — on CBC Books and Gem — or to listen to as a podcast. When Eisen was 15 years old, he and his family were taken from their home to Auschwitz, where Eisen worked as a slave labourer. He survived the Holocaust and emigrated to Canada in 1949. Eisen has toured the world, educating people about the horrors he survived during the Second World War. He has recorded his memories in the deeply moving memoir By Chance Alone. Eisen now lives in Toronto. You can read an excerpt from By Chance Alone below. In the spring of 1998, I was asked to accompany a group of 150 Toronto teenagers on a trip to Poland, where they would participate in the March of the Living, an annual event that takes place on Yom HaShoah, or Holocaust Remembrance Day. Each year, ten thousand individuals from around the world gather at Auschwitz I and march together to Auschwitz II–Birkenau, where they attend a memorial service for the six million Jewish people murdered by the Nazis and their local collaborators. Amy, my eldest granddaughter, was a part of this group; at sixteen, she was nearly the same age I was when I first entered the camp, in 1944. As a survivor speaker, I was tasked with filling in the missing pieces: the sounds, the smells, and the feelings of this place. For the first time in fifty-three years, I was going to enter the extermination camp where the Nazis had murdered so many of my family and friends. With no gravesites to visit, this was the closest I could get to their spirits, and I knew it would be a difficult experience for me emotionally. For the first time in fifty-three years, I was going to enter the extermination camp where the Nazis had murdered so many of my family and friends. My arrival at Auschwitz II–Birkenau in May 1944 was a terrifying experience. When I got off the train, I immediately noticed four huge crematoria very close to the platform and nestled among some birch trees. Although I didn't learn their purpose until later, these ominous structures with their massive chimneys were belching flames and smoke, and the brickwork crackled from the heat of continuous use. I recall feeling speechless and short of breath, like something monstrous was going to engulf me. As I lined up on the platform, separated from my mother and siblings, I was helpless and alone, afraid of the unknown. The SS soldiers manning the platform had a brutal look about them, and the skull-and-crossbones symbol on their caps made me panic. When I returned to Auschwitz II–Birkenau in 1998, there were no immediate signs of the towering chimney stacks or the buildings that had once housed the gas chambers and crematoria. The SS destroyed them before they abandoned the camp in January 1945, and the structures now lay in rubble. The birch trees had grown taller, and where once there was mud, there was now green grass cover. Gone was the smell of burning flesh and the skinny prisoners in their flimsy attire, hounded by SS guards. The place looked strangely benign to me now, and I was struck mostly by the sheer vastness of the site, the ruins of the barracks, and the barbed wire. A few kilometres away at Auschwitz I, I saw the barracks where I spent so many nights, the places where I was forced to stand at appel for hours, and the spot where the orchestra played. I remembered the hunger, the terror, the constant exhaustion. But I also remembered a few critical moments of advice, small kindnesses, conversations with my fellow prisoners, and the camp hospital that became such an important part of my story. Sherri Rotstein, one of the organizers of the Canadian contingent of March of the Living, recalled seeing me that afternoon surrounded by the program participants. She said I was staring into the distance and she wondered what I was thinking about. She knew I had journeyed back — emotionally and physically — to a very dark place, but she was heartened by the fact that I was surrounded by Jewish youth, the Jewish future. It was true that being back at the camp filled me with sorrow, but it also gave me comfort as I watched Amy place a picture of my lost family members on the ruins of Crematorium II. I knew they were with us in spirit. And Amy represented the generations of children and grandchildren who'd thrived in the aftermath of the genocide. My first pilgrimage back to Auschwitz-Birkenau gave me the strength to see, feel, and transmit the horrific deeds that the Nazis had perpetrated there. It was on this trip that I recommitted myself as a Holocaust speaker and educator, work I had first undertaken six years earlier. I have since kept up a rigorous schedule of presenting at schools and other events, and I've travelled back to Auschwitz many times. On one of these trips, my other granddaughter, Julie, joined me. She told me that she remembered hearing the stories of the death camps as a little girl, but it was not until she walked on the grounds of Auschwitz that she really understood the level of the Nazis' deception and the extent of the destruction of human life. She described the impact of seeing my barracks, my bunk, and the places where I laboured. She had always regarded me as a strong, happy, energetic man unscarred by the tragedies that befell my family and me. She told me how much she respected my personal mission to educate as many people as possible about the fate of the Jews during the Holocaust. It puts their own struggles in perspective, encourages the protection of a democratic society, and helps them speak out when they see injustice. I made my very first public presentation to a group of grade 13 students at St. Joseph's Catholic high school in Barrie, Ontario, in May 1992. I was nervous and felt myself breathing shallowly as I stood before them and rapidly told my story. I did not have the public-speaking proficiency to transmit my presentation with ease. After I'd finished, I told myself that I'd never do it again. But a few days later, the teacher sent me a thank-you note stating how much the students had appreciated my candour, and how much better they now understood the Holocaust. This feedback gave me the confidence I needed, and I continued to speak by invitation at other venues. From that day forward, I embarked on a lifelong journey of learning, and I honed my speaking skills for different age groups. Today I speak to grade 5 students and university students, and everything in between. I have travelled the breadth of Canada, from the Maritimes to British Columbia, on speaking engagements, addressing audiences large and small, from classroom size to almost two thousand high school students in a large auditorium. On one occasion, during a session with an elementary school in Sudbury, Ontario, I was greeted at the door by a group of grade 5 students, and I saw they all wore Star of David stickers on their chests. They asked me if I wanted one too. I put mine on and they escorted me to the classroom, where eighty students were assembled. The teacher informed me that they had read a book entitled Number the Stars and were sensitized to the sting of discrimination. I spent two hours with them and told them my story. They had written down several questions on pieces of paper, and I did my best to address them. When we finished, they all lined up and wanted me to sign their question papers and add a comment. Some of them even had extra papers for me to sign for their families. A few months later, a parcel arrived from the school. In it was a felt quilt with twenty panels portraying what the students had learned from my presentation. One panel depicted a locomotive pulling cattle cars. Another showed fishing dories carrying Danish Jews to Sweden. Yet another had an image of my family, including my two brothers holding hands. The quilt was truly a remarkable memorial project, and it reinforced for me the importance of fully engaged learning about history. Many of the students I speak to are in grade 10, because that's the year when Second World War history is taught. I challenge myself to hold their attention for one and a half hours, as well as through the subsequent question-and-answer period. Often, students approach me after my talks to make comments, take pictures, or ask for my autograph. Teachers and principals have told me many times that they are in awe of how well the students concentrate when I speak. The many letters I receive from the students and their teachers attest to the fact that they really do understand the importance of Holocaust history. It puts their own struggles in perspective, encourages the protection of a democratic society, and helps them speak out when they see injustice. I recognize how important it is for survivors to tell their stories, and to honour and remember the people and human potential that was lost. In addition to speaking at elementary schools and high schools, I have given frequent (sometimes annual) presentations at many universities and colleges, including Lakehead, Trent, Ryerson, Brock, the University of Northern British Columbia, The University of Alberta, the University of Manitoba, the University of Regina, St. Francis Xavier, Western, and Seneca. I've also addressed the York Region police cadets, the Ontario Provincial Police, and the Canadian Forces College in Toronto. I've made presentations at churches, synagogues, libraries, and community centres during Holocaust Education Week. My out-of-town engagements are very intense; sometimes I make as many as five presentations in three days. These trips can be physically and emotionally exhausting. But I feel they are necessary. And despite the demanding nature of the work, I'm always happy to meet diverse people across our country. If I am available, I will never refuse a request to speak. While painful, my work as a Holocaust educator has also renewed my spirit. I believe that a new generation can relate to the Holocaust and its lessons with an understanding of how evil can operate when it remains unchecked. It is my hope that the students I meet will combat racism and bigotry wherever they see it, and that they will speak out and make a positive difference in Canadian society. After many visits back to Auschwitz, I can also see that the physical remnants of the Holocaust continue to deteriorate, and that the first-hand witnesses, like me, are moving on in years. I recognize how important it is for survivors to tell their stories, and to honour and remember the people and human potential that was lost. This volume is the final step in my journey as a Holocaust educator, and it stands as my own permanent contribution to this history and to the memory of my loved ones who were lost to this horror. From By Chance Alone by Max Eisen ©2016. Published by HarperCollins Canada.